March 7, 2016 – A bill in the Utah Legislature may give victims of bike theft some relief. Senate Bill 157 would change the law so that if your bike is stolen and ends up at a pawn shop, you may be entitled to receive your bike back without having to pay the pawn shop for it. Currently, the law states that if your bike is stolen and ends up in a pawn shop, the original owner may need to buy that bike back from the pawn shop. As backwards as this seems, it is the current law. Since pawnshops are required to send whatever is pawned to a state database, this should result in more bikes being returned to victims. According to sources, since the pawnshop and payday lending lobby is very strong, the bill is a compromise among cities, counties, pawn shops, law enforcement, and the crime victims groups, and is the best that can be hoped for this session. The bill has passed the Utah Senate and is off to the House. The bill is now in front of the House Law Enforcement and Criminal Justice Committee. The legislative session ends on Thursday, March 10, 2016. The bill will be considered in the Committee on Tuesday, March 8, at 5 pm. This is a bill that will help, but it is not a cure-all. One of the key items that needs to be changed is to increase the period that pawnshops need to hold items before they are sold from 15 to 30 days. 15 days is often too short to find a bike in a pawn shop. For some goods, victims may not even know that the item was stolen in 15 days. Cyclists are encouraged to support the bill by contacting members of the House Law Enforcement Committee and their own representative. Action needs to be taken by Tuesday, March 8, 2016 before 5 pm, which is when the Committee meets. If the bill passes out of committee, then it is important to contact house members as soon as possible since the session ends on Thursday, March 10, 2016 at midnight. Cyclists are encouraged to contact their Utah House Representative: http://le.utah.gov/house2/representatives.jsp as soon as possible. 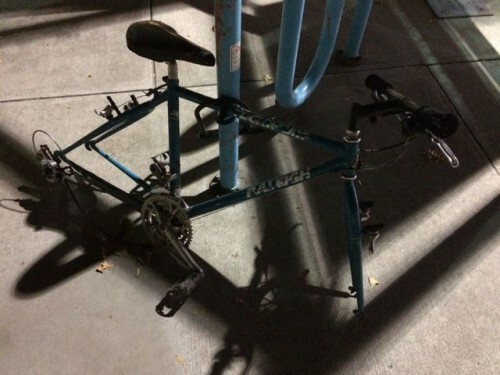 One Response to "Utah Bike Theft Victims May Get Some Relief with Senate Bill 157 (2016)"